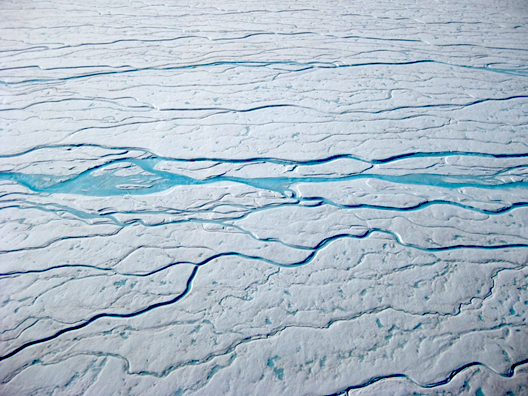 TORONTO, January 4, 2016 – The Greenland ice sheet has traditionally been pictured as a bit of a sponge for glacier meltwater, but new research has found it is rapidly losing the ability to buffer its contribution to rising sea levels, says a York University researcher. York U Professor William Colgan, a co-author on the study published today in the journal Nature Climate Change, helped analyse data from three expeditions to the Greenland ice sheet in 2012, 2013 and 2015. The research was done in conjunction with lead researcher Horst Machguth of the Geological Survey of Denmark and Greenland, Mike MacFerrin of the University of Colorado at Boulder and Dirk van As of the Geological Survey of Denmark and Greenland Copenhagen, Denmark. Colgan spent five weeks with the team in 2013 drilling firn cores in the interior of the Greenland ice sheet. Firn is multi-year compacted snow that is not as dense as glacier ice. Instead, it forms a porous near-surface layer over the ice sheet. Dropped off by a ski-equipped US Air National Guard C-130 Hercules in minus 40 degrees Celsius weather, with 6,000 kilos of supplies and equipment, the team set up several camps and drilled a series of shallow firn cores about 20 metres deep during their time on the ice sheet. The researchers also towed a radar unit behind their skidoos to gather profiles between core sites along a 100-kilometre path from the low elevation ice sheet margin into the high elevation ice sheet interior. They analysed the firn cores on the spot by cutting them into small sections to quantify their properties, such as their density, so they could compare them with samples collected the following year. “The year-on-year firn changes were quite dramatic,” said Colgan. Because the models scientists use to project Greenland’s sea level rise contribution do not presently take firn cap-off into consideration, it means that Greenland’s projected sea level rise due to meltwater runoff is likely higher than previously predicted. Getting this newly observed physical process into these models is an important next step for the team. Using unmanned aerial vehicles, Colgan also plans to begin surveying the changes in ice sheet surface reflectance caused by the development of massive ice layers associated with firn cap-off. There are preliminary indications that firn cap-off is also occurring in the ice caps of the Canadian High Arctic. York University has always been known for championing new ways of thinking that drive teaching and research excellence. Our 52,000 students receive the education they need to create big ideas that make an impact on the world. Meaningful and sometimes unexpected careers result from cross-discipline programming, innovative course design and diverse experiential learning opportunities. York students and graduates push limits, achieve goals and find solutions to the world’s most pressing social challenges, empowered by a strong community that opens minds. York U is an internationally recognized research university – our 11 faculties and 24 research centres have partnerships with 200+ leading universities worldwide.